Three syllables that would make most foodie’s heart palpitate a little bit more. The mere glimpse of chef owner, Shannon Bennett’s shaggy do or mere mention of his name is enough to make our knees tremble. I’ve been fortunate enough to dine at the famed Vue de Monde twice. Once, for their Express Lunch promotion and the second time for a Glenmorangie Whisky Secret Society Dinner Event. So, you can say I belong to a privilege crowd. 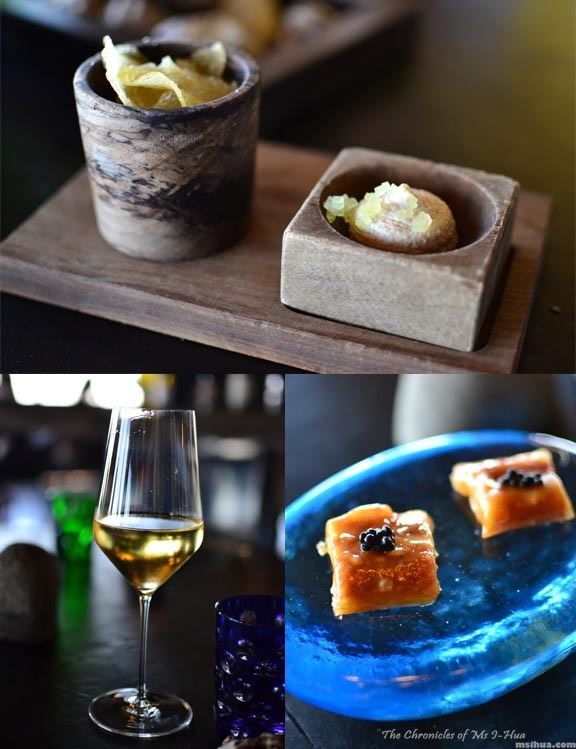 However, having been twice, I had not dined on their famed degustation meals though I had sampled a few dishes from the full degustation range. So when I turned the big 3-0 earlier this year, The Boy decided to splurge a little on me and took us both on a very fancy birthday lunch experience. 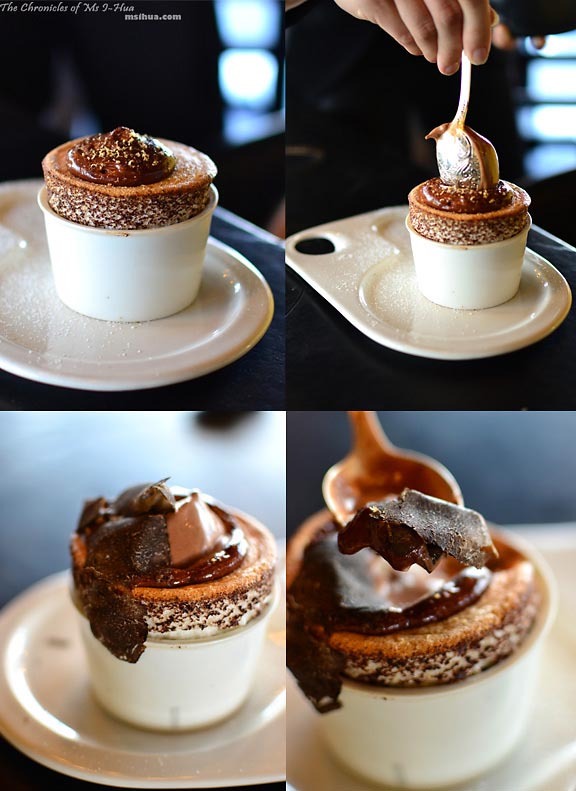 If you’ve never dined at the new Vue de Monde (old location being Normanby Chambers) located at the Rialto towers, then you are in for a treat. You are first greeted by the concierge downstairs who starts a conversation with you to ease you, escorts you to the special lift which I like to call the ‘Disco Lift’, and presses the button for the 55th floor for you. As you reach the top of the floor (with your ears popping all the way), you are greeted by a smartly dressed waiter who will bring you around the Lui Bar area (with magnificent views) and to your table in the restaurant. With their move to the 55th floor of Rialto Towers, Vue de Monde is such a perfect name as it literally translate to “View of the World”. 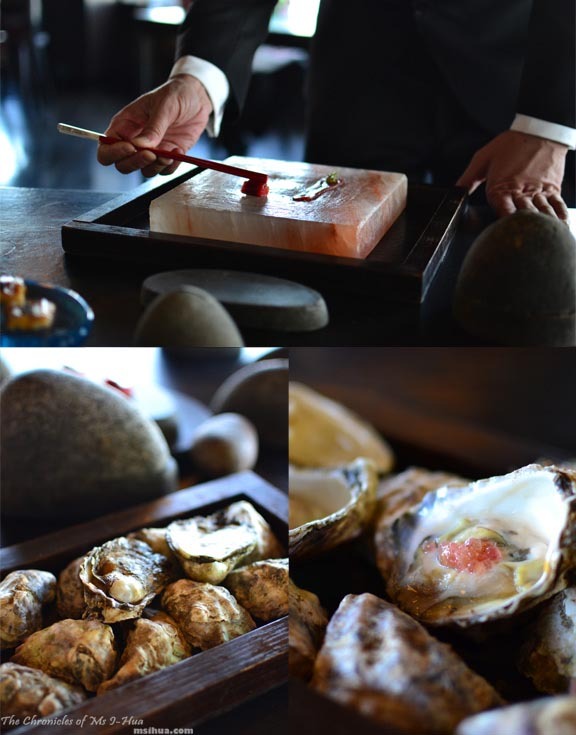 Our meal started with the Himalayan Salt Cured Wallaby with herb puree followed by the Clair de Lune Oysters with Finger Lime. The texture of the wallaby reminded me a bit of cooked tuna and it wasn’t gamey at all. 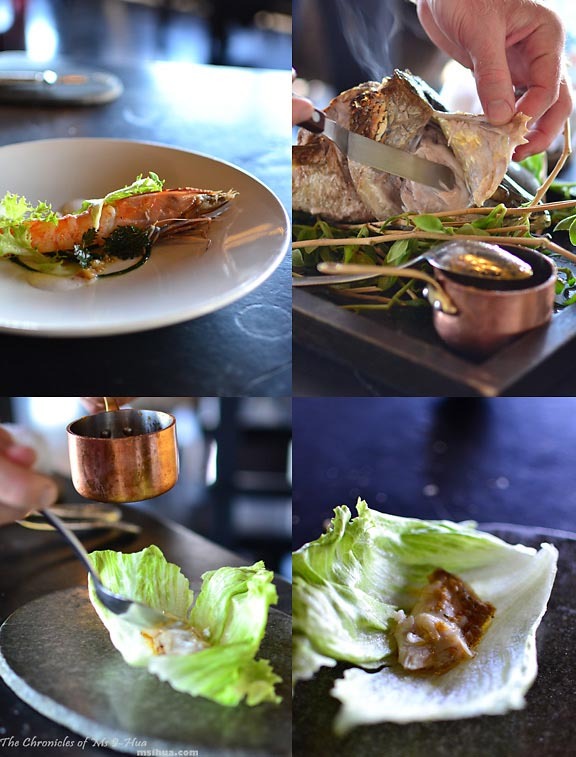 Dining at Vue de Monde is definitely all about the experience and drama. 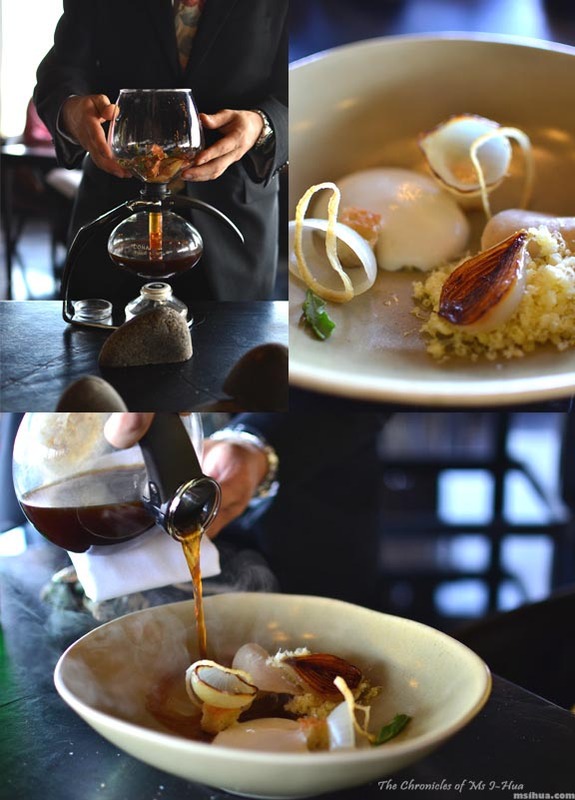 The way the food is served and presented to the actual taste, it is definitely an experience to behold. We also had a fancy version of Chips & Dip as well as Smoked Eel, White Chocolate & Caviar. Pretty indulgent start and we were ready for the degustation to commence! I also had a glass of wine, a 2004 Framingham Riesling, Marlborough, New Zealand. This dish was very light and had a brief hint of the sea. It was one of the top dishes for The Boy that afternoon as he liked the different textures on the plate. Classic Vue de Monde dish, you haven’t dined at a proper fine dining restaurant until you’ve been to one where they serve you a dish with no cutlery. Using your God given utensils, you pick up the marron, roll it around in the brown butter before finishing off with the marron powder. 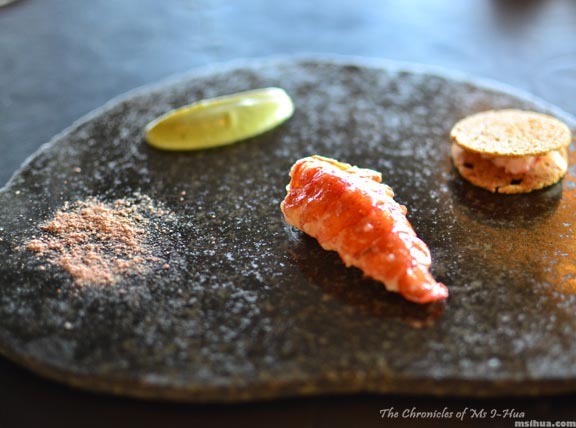 Not only was this dish delectable, it allowed you to eat with all your five senses by making you touch the food. Course 3: Melbourne Onion Soup. 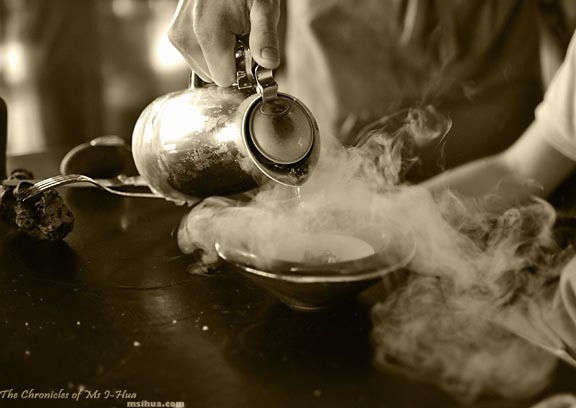 Served with an old school coffee syphon. The soup consisted of fried onion, pickled onion, caramelised onion, foam, gruyere cheese and croutons. We had to laugh as I’ve become quite the coffee snob of late. So when our wait staff rocked up to the table with this 1950’s vintage coffee machine (in a play of Melbourne’s worship to coffee) to serve up the next course, I was in a fit of merry giggles. I love onion soup and often get The Boy to make me his French Onion soup. But now that I have tasted THE onion soup, I’m going to expect big changes when he next makes it in our humble kitchen. Course 4: Duck Egg Yolk, Pancetta, Green Beans, Mint, Egg White Crumbs & Toast. 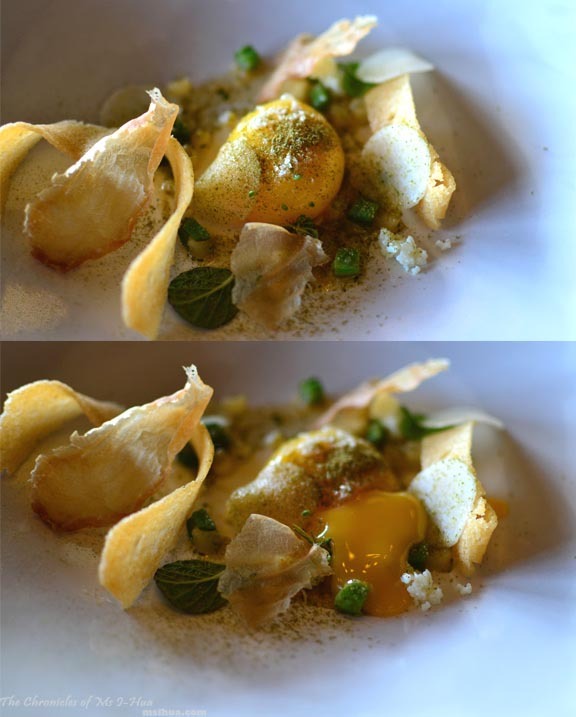 Even in a fine dining establishment, The Boy and I will still try to get the best #yolkporn #eggporn action for you! This was quite a dense dish with the use of duck egg. Palate Cleanser 1: Flowers & Herbs in Liquid Nitrogen with Lime & Grapefruit Sorbet. 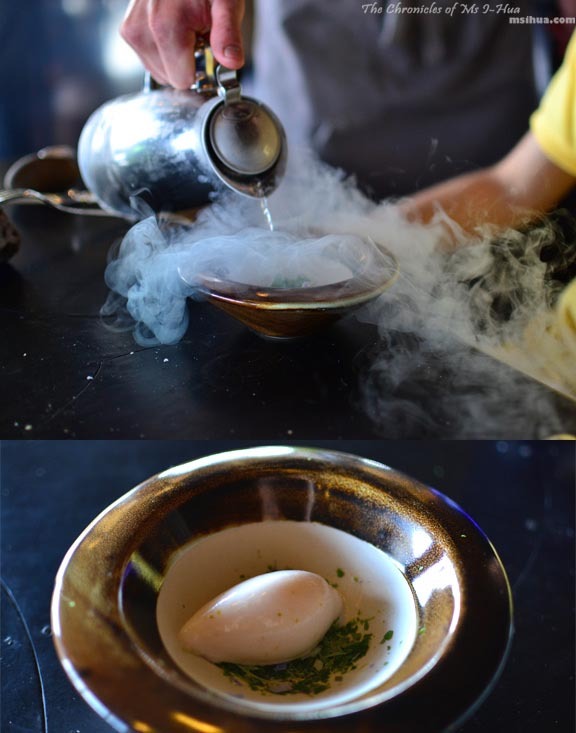 As I knew what was coming next with the palate cleanser, I kept my mouth shut as I wanted The Boy to fully enjoy the experience of smashing his own herbs frozen with liquid nitrogen. He loved it 🙂 This palate cleanser is so much fun. Course 5: Banana Prawns with Nettle Puree, Broccoli & Barramundi Foam. The prawns were very fresh and beautifully smoked. Along with this course, we were also served with a Barramundi Cheek, Lettuce Cup with Gascony Burnt Butter, I dubbed it the Vue de Monde Sang Choi Bao. Upon seeing the entire Barramundi head sitting on the tray, I commented that it would be great if the wait staff left it behind so that I could devour it. He looked at me and laughed, with a twinkle in his eye, I knew he knew that we both knew that I was a lover of food and quite serious about that proposition. Sadly, in order to maintain decorum in such a fine establishment, I had to say no to having the whole fish head to myself much to The Boy’s relief. 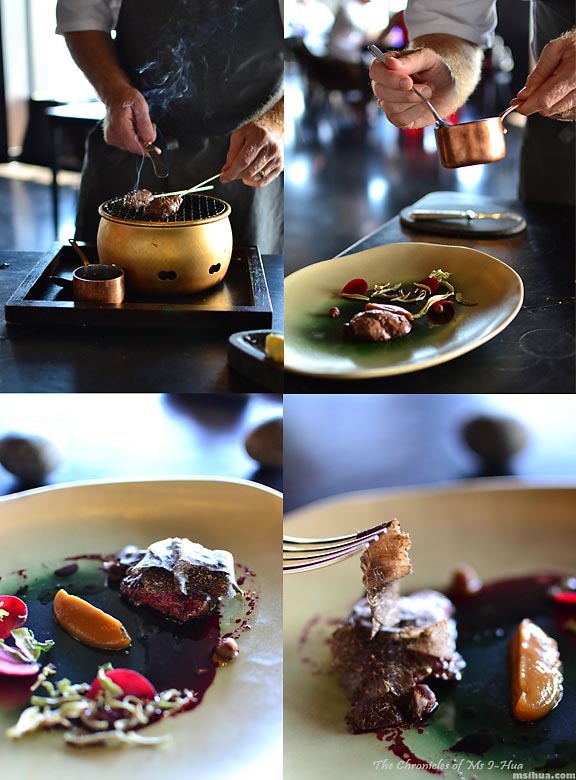 Course 6: “Aussie BBQ”: Kangaroo, Beetroot, Salt Bush, Munthari Berries, BBQ Sauce & shaved Black Perigord Truffles. The highlight dish for us in the entire meal had to be this. The kangaroo was cooked to perfection. The accompaniments matched perfectly and as Jamie Oliver would say, “Oh, my lord!” the Perigord truffles were amazing. Everything played so wonderfully well together and the flavours just danced in my mouth. 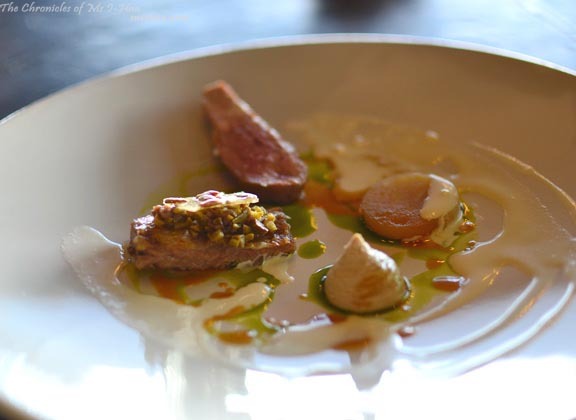 Course 7: Flinders Island Lamb Loin & Belly, Olives, Australian Anchovies, Sunflower Seeds, Apple & Mustard. This was another dish that we could not fault. As much as I love lamb (and you all know I really love lamb), I have to say, if I had to have a last meal on earth, I would like to change my list to include kangaraoo. 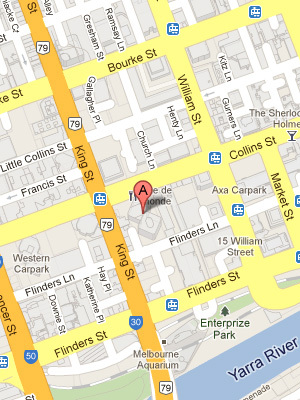 Only kangaroo from Vue de Monde to be specific. All too soon, despite our bellies being stretched beyond normal, the savoury courses were over. To help us move on to the desserts, we had the cheese course. In comes the Cheese Trolley (yes, they have one of those too) and we were asked what kinds of cheese would we normally purvey. The Boy said he would like creamy and soft cheeses whilst I said I wouldn’t mind a range of soft cheeses and blue cheese. Course 8: Assortment of Cheeses, Breads & Jams. The freedom to choose our cheeses completed by the cheese expert resulted in a risky move. 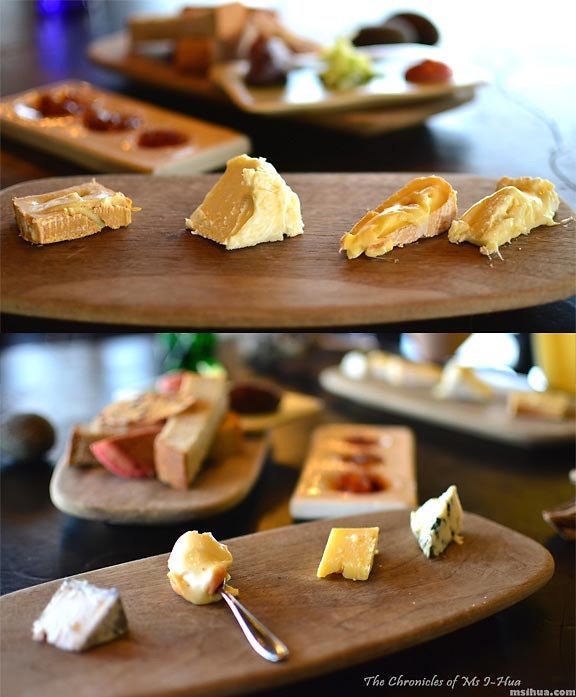 However, we were more than pleased with the end selection which included a Roquefort cheese and the Epoisses de Bourgogne which due to its odoriferousness, is banned on public transportation in France. And I absolutely loved it! Palate Cleanser 2: Passionfruit, Licorice & Coconut. 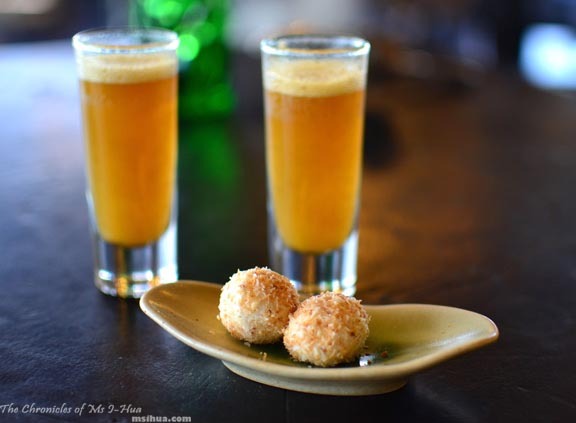 For our second palate cleanser, we had essentially Vue de Monde’s version of Beer and Nuts. Not your commonplace beer and nuts mind you. These were Passionfruit and licorice beer (why not?) and coconut sorbet to finish off. For our first dessert of the degustation, we were served Strawberries and Cream. Again, not the traditional take on a classic dish, but a deconstructed version. 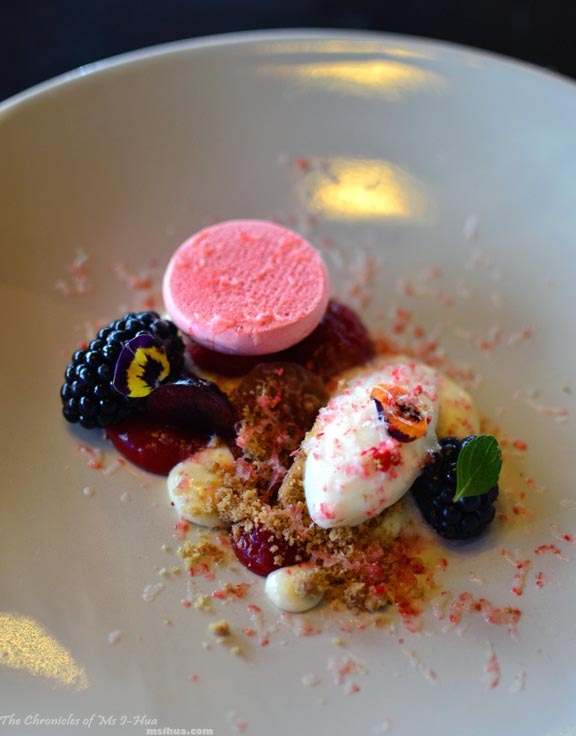 The berries offer different textures as does the white chocolate ice cream, shaved frozen strawberries and crumbs that are scattered throughout the dish. Course 10: Tonka Bean Souffle, Smoked Cocoa Ice Cream, shaved Black Perigord Truffles. Just as we thought we’d seen everything we possibly could, out comes the truffle trolley once again, together with our final course. Our wait staff so kindly tells us, “If you’ve never had chocolate together with truffles then you haven’t lived”. He then proceeded to tease us by enfolding a spoonful of smoked chocolate ice-cream into the souffle and then slowly shaving the Perigord truffles over it all. I nearly swooned out of my chair at his actions! Upon my first mouthful, I was in heaven. In my subsequent mouthfuls I truly believed that I had died and attained Nirvana. Such was the deliciousness of it all. Truffles and chocolate are a match made in heaven. Petit Fours: Cherry mousse lamingtons, meringue leaves, dark chocolate shards, One Penny gold coated gin jellies. 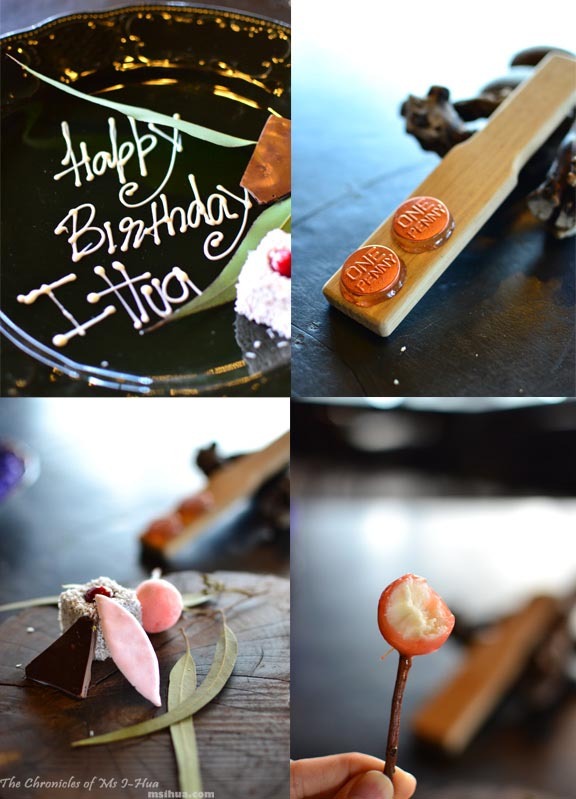 When I’d finally stop being a puddle on my chair from the last dessert, a surprise dish of personalised petit fours arrived with a birthday greeting for me! (Awwwww)! My favourite was still the cherry mousse lamingtons and the gin jellies. With that my friends, we ended a spectacular birthday lunch sky-high in Melbourne. What an utterly amazing meal! I am truly in food awe! I am starting a new board on pinterest for Melbourne restaurants I want to visit Purely because I don’t want to forget about this one the next time I am there! I know! My list keeps getting longer! Eep! I bet you feel super full after this hahaha! Happy birthday indeed! What an incredible meal you had, you very lucky things! Maybe one day I’ll get there…. I am drooling reading this. 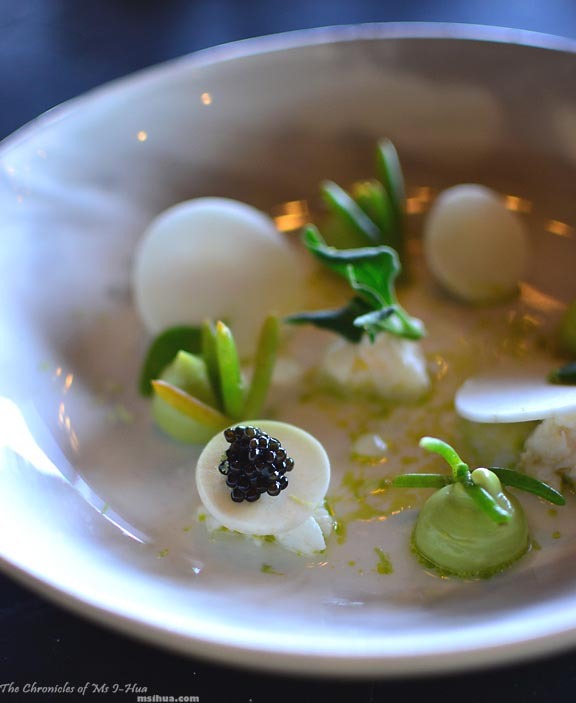 Like you I’ve eaten at Vue de Monde twice – but never the full degustation. Pity my 30th is long ago. 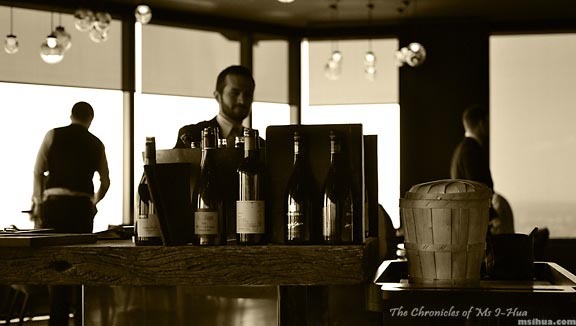 I was fortunate enough to dine at the old VDM – and loved it. Haven’t had a chance (or a legit excuse!) to dine at the Rialto restaurant but one of these days, I will… (not particularly keen on waiting until a milestone birthday though haha). Too late! Your wisdom comes too late!! We just had the 8-course (which is really like 14 course) dinner at Attica for our 1 year anniversary and the whole experience was absolutely sensational. You should definitely go there! I’d be curious to see what you think about the two, compared. Aww thanks! Nope, they were quite pleasant and never commented on us. Sometimes even slowed down so that we could take the ‘shot’! Oh and we went to Attica a while back and loved it! VdM is very different in comparison!